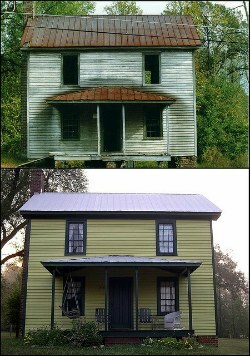 So, the house has a totally different look now! Ну вот, тепе́рь у до́ма совсе́м ино́й вид! Э́то не что ино́е, как страх. The only thing it can be is fear. literal That's nothing else but fear. You're an idler, to put it in another way! literal In other words, you're an idler! Ино́й раз мне совсе́м ниче́м не хо́чется занима́ться. Sometimes I just don't want to do anything at all. literal Another time I just don't want to do anything at all. В ины́х слу́чаях лу́чше рискну́ть. In some cases it's better to risk. literal In other cases it's better to risk. Не пережива́й, вопро́с реши́тся тем и́ли ины́м о́бразом. Don't worry, the problem will be solved this way or another. literal Don't worry, the question will be solved this way or another. Some people can be envied! literal A different one can be envied! Не пу́тай! Э́то совсе́м ино́е де́ло. Don't mix it up. It's a completely different matter. Я оце́ниваю э́то с ино́й пози́ции. I appraise it from another point of view. literal I appraise it from another position. Э́то написа́л не кто ино́й, как он. He is the only person who could have written it. Ино́й стреля́ет ре́дко, да попа́дает ме́тко. It's better to do something once, but well-done. literal Some people shoot rarely, but always hit the target. С ины́м води́ться - что в крапи́ву сади́ться. Some people are really unpleasant. literal Meeting some people is like sitting down in the nettle. Some old people are more active than the younger ones. literal Some people with gray hair are worth ones with curly hair.